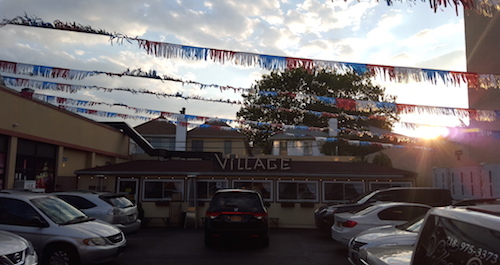 Almost everyone in my group of five walked right past the small Village Cafe on Coney Island Avenue without noticing the restaurant, which is set at the back of the neighboring liquor store's parking lot. With it's colorful streamers, it all appears to be a working used car lot, and it takes further investigation to find that what is inside is actually some of the city's best Azerbaijani cuisine. On their menu, the restaurant declares itself "Your Village Away From Home," and has a quaint rustic wooden environment for its patrons. The staff is more helpful than your typical NYC former-Soviet staff, and tables fill up with well-behaved customers, at least on a weeknight. Russian speakers are the only crowd here. 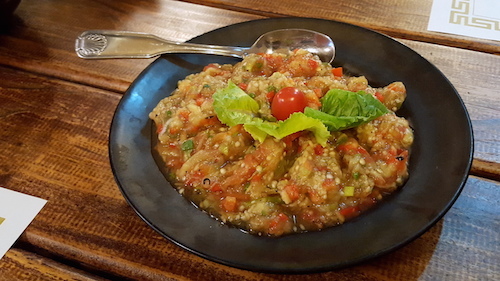 All of us were starving, so we charted a course to bring far too much food to the table and quickly, starting with Journey to Baku ($11, below), a dish of smoky grilled eggplant, tomatoes, and peppers, heavily laced with garlic. 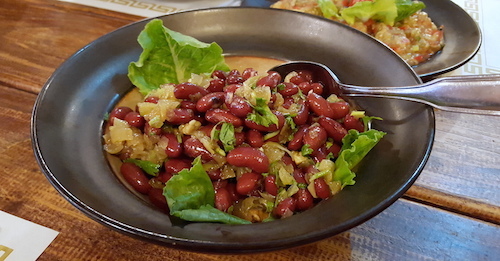 After our journey to Azerbaijan's capital, we also tried the simple dish of kidney beans called lobio ($7, below), quite different from the walnut heavy version of neighboring Georgia. This also has some garlic, cilantro and cooked onions, but evens out fairly mild. 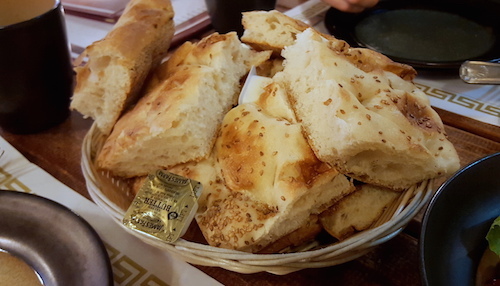 We were "upsold" on a basket of Turkish bread ($3.50, below), but did not mind at all as it comes fresh and hot. 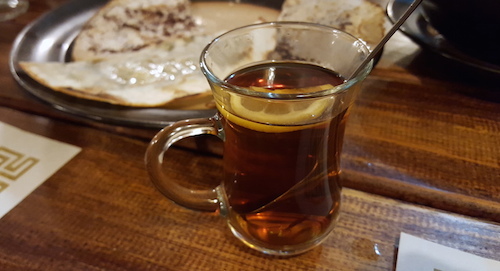 Azerbaijani food does not really have a good scoop quality to it, but the bread can be eaten alone or dipped in the soups that came later. A must for any meal here is the assortment of kutaby ($2 each, below), a thin pancake with an even thinner layer of your choice inside. In the photo below are chicken, greens, and meat from back to front. We enjoyed the spices in the chicken the most, but the variety is nice and next meal we will certainly order more of these. Tea service comes in a big heavy and piping hot pot, costing $10 and enough for each person in our group of five to have at least two cups. 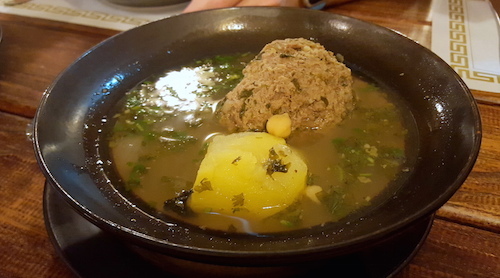 Kyufta-bozbash ($8, below) is a chickpea soup with a gigantic meatball plopped in the bowl next to a potato. 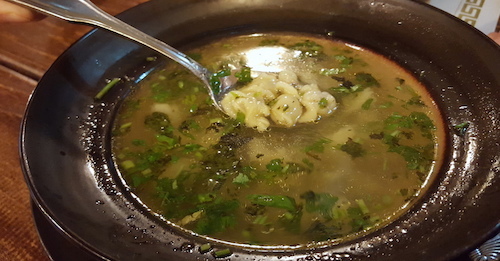 The broth is warm and hearty, salty but not too much so and herbal. Opening up the meatball reveals what I first took to be an apricot (after mistaking it for undercooked meat), but is supposed to be a sour cherry plum according to recipes. Watch out for the seed! 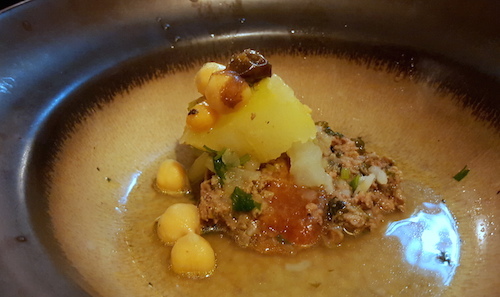 Our next soup was dushbara ($8, below), a soup with miniature homemade lamb dumplings. Needless to say, there was not enough to go around for a group of five, as we all thought this was delicious. Our biggest leap of faith for the night was the djiz biz ($15, below), described on the menu as "Azerbaijani roast kidneys, heart, sheep testicles, liver, potatoes and onions." For something with so many "interesting" ingredients, I found that the potatoes and onions provided a lot of flavor, while the whole thing was quite greasy. Iron levels seemed low, and you probably would have no idea you were eating balls if no one told you. We felt some accomplishment after eating it, but no one particularly thought this was delicious. 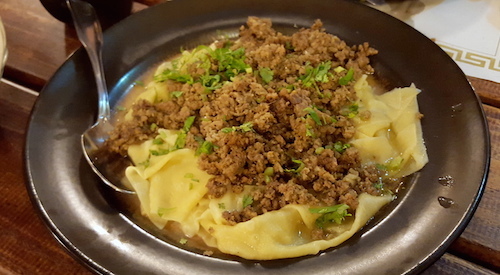 Thin strips of handmade dough folded over each other are the yummy base for guru hingal ($12, below), which combines minced lamb and tail fat on top. These tastes are nothing extraordinary but classify 100% for comfort foods and create a very memorable dish. 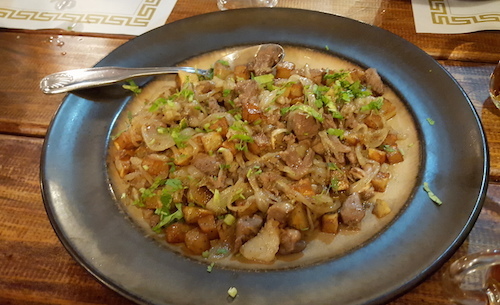 Azerbaijani pilaf ($13.50, below) was highly recommended to us by the server, and was quite different from any other versions from Central Asia. 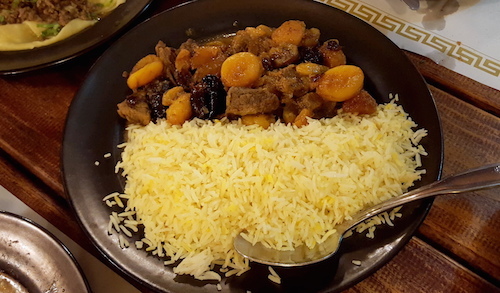 Instead of a mixture, the non-rice ingredients are plated next to the rice, and include a hearty helping of dried plums, cherries, and apricots with the tender lamb. Very happy we got to try this unique version. 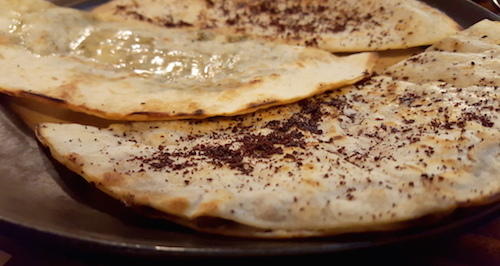 Two typical Azerbaijani pastries came to the table at the end of our meal under a soft blanket of powdered sugar. I first had shaker bura ($3 each, below) at the Baku Bakery in Bath Beach, and a couple times since in Georgian restaurants. 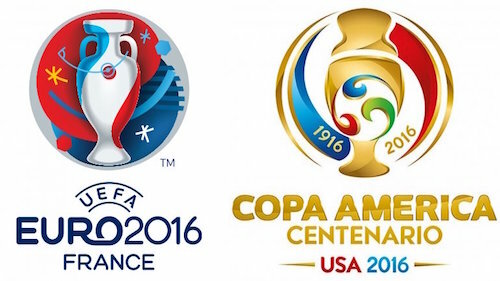 They always seem to be vastly better in the Azerbaijani places, as they are here. The two year anniversary of this restaurant has recently passed in June, but it seems to have very little recognition on the internet. Get a group together and enjoy this delicious secret for yourselves. write about bad experiences, all ratings here are from "good" to "best." 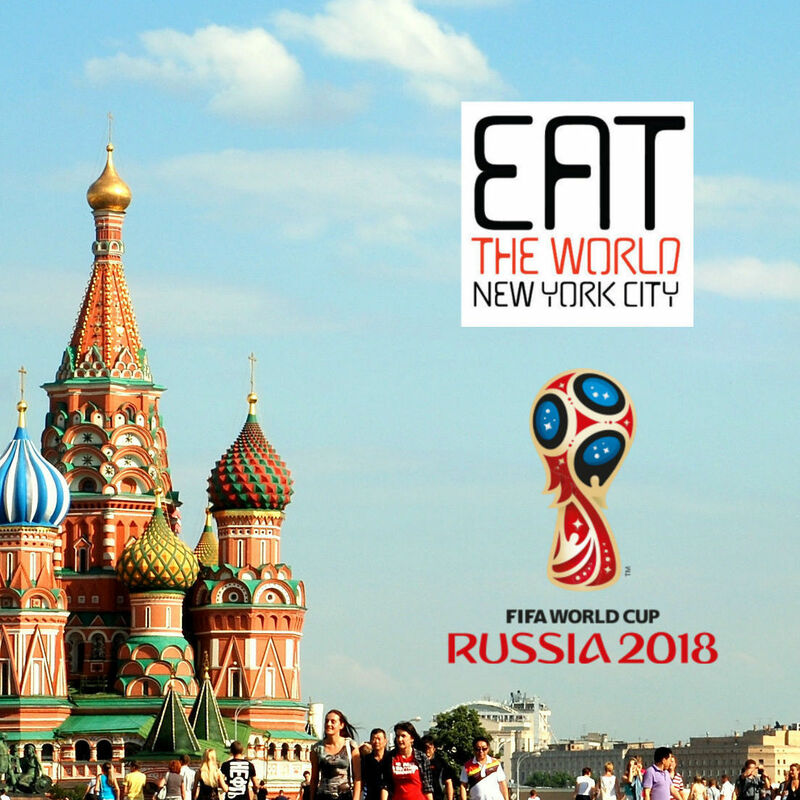 Where to Watch the 2018 World Cup in NYC and NJ With All 32 Nations.